The market for hybrid, electric and small cars that are not allowed to tow is growing. Brink invests in a wide range of solutions for these vehicles. Most electric and hybrid cars cannot tow a trailer or a caravan due to the potential overworking of the battery, lack of power, or exceeding the CO2 emissions standards. However, many environmentally-friendly cars have a ‘vertical load’, which means that a carrying solution is possible. Brink developed the RMC for this purpose a few years ago. This towbar can carry, but not pull. Therefore, you can use your hybrid or electric car to carry your bike or e-bike, because almost all types of bike carriers fit on the Brink carrier solution. To be able to deliver the best solution for the coming years, the RMC has taken on a new design. The strip on top of the towball has been replaced by a pin through the towball. Because of the pin, no trailer, caravan, boat or horsebox can be attached to the towball. In this way, we prevent you from permanently damaging your vehicle in case you try to attach a trailer or caravan to your car. The advantage of the new design is that more types of bike carriers can be fitted to the system. Brink has two types of system: RMCa and RMCu. Both systems are exceptional for their user-friendliness; no other system has such an easy and effortless way to lock and unlock the towball. With both the RMCa and the RMCu, the socket can be folded behind the bumper. The difference between both systems is the way in which you attach the towbar; diagonally or vertically. An RMCa or RMCu is available, depending on the type of car. We will gladly inform you about the possibilities. Brink develops its bike carrier towbars so that they stay within the maximum axle load of your car. For this, we indicate a maximum towball pressure. When choosing a bike carrier, it is important that you take into account the maximum ball pressure of the bike carrier towbar. The total weight of the bikes and the carrier cannot exceed the authorised ball pressure. A ball pressure that is too high can cause dangerous situations, such as an excessive load on the car suspension and the towbar attachment. It also has negative effects on the power steering and driving properties. The ball pressure of the bike carrier towbar is stated on the type plate, which can be found next to the plug connection or on the bar of the towbar. Are you curious about which bike carriers fit the RMC system? See here for the list of bike carriers. 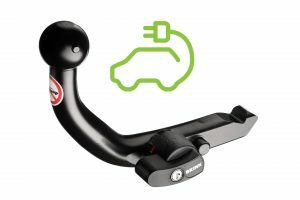 Brink specially developed the RMC towbar for hybrid and electric cars. This is a towbar that cannot be used to pull a trailer or a caravan, but can be used for a bicycle rack. This allows you to always have your bicycles with you. Some models will not fit on the RMC towbar.